The Alberta Emerald Foundation strives to inspire Albertans to positive environmental action. Youth Environmental Engagement Grants, and our Sharing Stories communications initiative. EMERALD DAY events introduce our past Emerald Award recipients to young people around our province to encourage and inspire the next generation of EcoHeroes. Best of all, thanks to the support of our sponsors, EMERALD DAY is FREE of CHARGE to attend! EMERALD SPEAKERS SERIES: Presentations by Emerald Award recipients and finalists. ECOPITCH: An opportunity for youth to present their environmental dream project to a panel of judges for the chance to win $1,000 to help make it a reality. Success story displays hosted by local organizations, businesses, governments and schools. The Alberta Emerald Foundation believes in inspiring the next generation of eco-heroes by supporting Alberta’s young people (aged 25 and under) in their environmental efforts. With funds from founding program sponsors, and other sponsors and individual donors, the Alberta Emerald Foundation provides micro-grants of up to $500 to youth-led and youth-targeted environmental projects and initiatives. The Alberta Emerald Foundation intends to allocate over 100 Youth Environmental Engagement Grants each year.  To assist with the costs associated with environmental engagement activities, schools, classrooms, and community groups are invited to apply for a micro-grant of up to $500. For the development of new green spaces, or the enhancement and improvement of existing ones. Includes community gardens, outdoor classrooms, and urban naturalization projects. For educational experiences that result in environmental learning, inspiration, and personal/professional development. Includes presentations, experiments, field trips. For the initiation of renewable energy or energy conservation projects, or the enhancement and improvement of existing ones. One exemplary recipient receives additional funding through the Energy Efficiency Champion Award, presented at the Emerald Awards. For the protection and/or restoration and/or maintenance of natural habitats and areas. Also for the creation of new recycling or composting programs, or the enhancement and improvement of existing ones. There are two annual granting periods: August – December, and January – June. Successful applicants will receive a first cheque of (up to) $300. The second cheque of $200 will be issued once the Alberta Emerald Foundation receives a follow-up report about the project. Follow-up reports must be received within three months of the project start date. Only group projects will be considered. The project or initiative must be led by or targeted to individuals who are aged 25 years and under. Grant applications will be reviewed monthly. Funds will be allocated to those projects that best support the goals of the Youth Environmental Engagement Grant program. Grants will only be distributed to future projects, and cannot be backdated. A maximum of two grants will be issued to each school/organization per year. Applicants may submit their second proposal once their follow-up report from their first project has been received and approved by the Alberta Emerald Foundation. click on the button below to apply for a grant or to submit your follow-up report. Mr. Kruhlak’s astonishing 28-year contribution to the AEF continues through this special $1,000 grant, which is awarded to one of the past year’s leading Youth Environmental Engagement Grant recipients to help further their work. 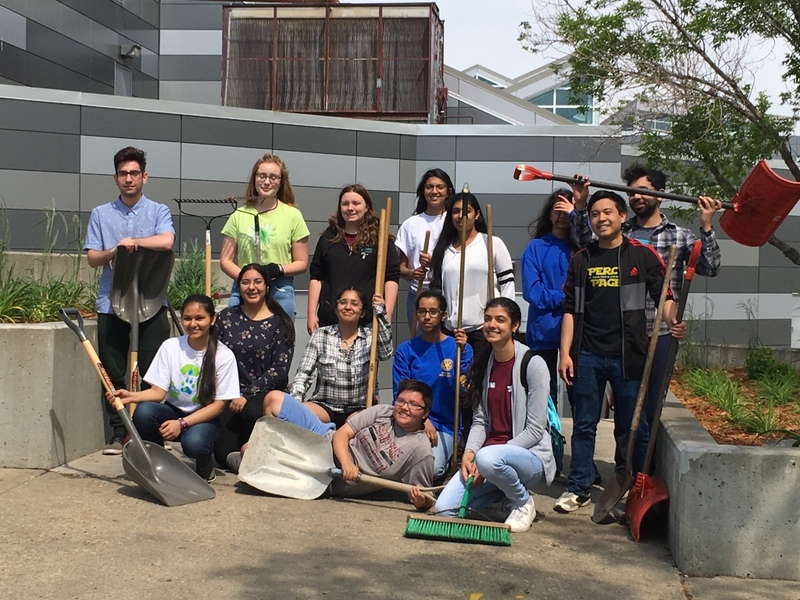 The long-running Rotary Interact Club at J. Percy Page High sees about 40 dedicated student members taking on multiple environmental projects each year. 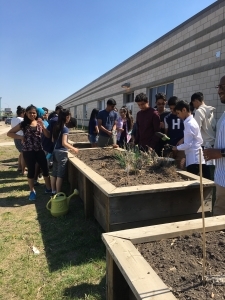 This year, Rotary Interact joined with the school’s Earth Club and 2018 Grad Committee for enhancements of the surrounding school grounds—an ambitious project that included spring litter cleanup in the Millwoods Park area near the school, and the development of several planter boxes on school grounds. Meeting after school and through many lunch hours, club members created a comprehensive plan with input from school, community and district levels. Over several days in May, club members removed garbage and debris, added soil and nutrients and transplanted trees and flowers. The reclaimed planter box initiative was aided by two retired tree nursery owners who helped create professionally-designed planter boxes for the deciduous shade trees, various hardy shrubs and pollinator-friendly flowers. The aesthetically-pleasing planters not only enhance school property, they also show pride in rejuvenating the biodiversity of the surrounding environment. Funds from the Alberta Emerald Foundation’s Youth Environmental Grant Program and the Ron Kruhlak Award helped purchase the nutrient-rich soil, drought-tolerant plants and trees for the program. Club students look forward to the positive reactions from graduates and their families as they pass the landscape features and environmentally-friendly planter boxes now enhancing J. Percy Page High School. After reviewing this year’s Youth Environmental Engagement Grant recipients, Energy Efficiency Alberta has selected an exemplary one to receive an additional $1,000 to continue their work with renewable energy. In Fort McMurray, year-round gardening just isn’t a reality. That’s what makes Ecole McTavish School and its solar Greenhouse and Community Garden project special. Thanks to the work of grade 7-12 student members, teachers and volunteers, tender vegetables and flowers can be planted inside in any season, whatever the weather, in an in-class greenhouse fitted with four roof-top solar panels. In Spring, when weather allows, seedlings can be transplanted into one of four large outdoor box-shaped community gardens. As plants grow through Summer, volunteer families take on the job of weeding and watering the lettuce, potatoes, zucchini, radishes, peas and beans, plus marigolds and gladiolas (which help keep bugs away from certain plants). Starting vegetables early in the season indoors allows students to host a mini farmers market before school breaks, with proceeds going back into the project and leftover produce donated to local food programs. While the solar panels help offset power costs and utilize renewable energy to grow greenhouse plants, they’re also the focus of an added lesson for science students by being broadcast on the school’s wifi—showing real time electrical input and output throughout the year. Energy Efficiency Alberta says the LEAP Solar Greenhouse and Community Garden is a project that integrates energy awareness and sustainable gardening practices, with an appreciation for natural resources and tech-enabled solutions. From PSAs and editorial stories about our Emerald Award recipients to social media engagement on Facebook, Twitter and YouTube, and the Emerald Speakers Series, the Alberta Emerald Foundation shares environmental good news stories with Albertans. This series provides a platform for Emerald Awards recipients and finalists to share an inspiring environmental talk about their work and their journey to achieving their successes. The series is presented live throughout the province and is also made available online via our website and social media platforms. Interested in booking one of our speakers for your event? Contact us at info@emeraldfoundation.ca. The Green Medium is an Emerald Award-winning youth-run blog that seeks to innovate how we discuss and inform ourselves on environmental concerns. The AEF is pleased to present a 22 blog series crafted by the young writers over 2017-18 inspired by our past Emerald Award recipients and finalists. Catch the series at thegreenmedium.com.